When it comes to healthy eating, many people feel that they are missing out. When contemplating a dietary change for health reasons, people are put off by the thought of plain, steamed vegetables and bland desserts. But it does not have to be the case. Eating well does not mean you have to forego taste and pleasure. There are many healthy pulses like lentils, mung beans and chickpeas that contain bags of nutrition and plenty of taste. You may not be quite as familiar with black gram but as you are about to find out, this popular Indian pulse is not only extremely healthy but can be used in a number of extremely tasty dishes that won’t leave you feeling guilty after eating them. A popular ingredient in Indian cuisine, black gram also known as urad bean, mungo bean or urad dal has its origins in India. Known scientifically as Vigna mungo, black gram has been cultivated on the Indian subcontinent since ancient times. Today, the pulse is a highly valued ingredient in India and parts of Pakistan. It is used especially widely in Punjabi cuisine where it is known locally as maai di daal. As well as being grown extensively on the Indian subcontinent, black gram is now cultivated in other tropical regions including parts of Africa, Mauritius, Fiji and the Caribbean. You may be unfamiliar with black gram but if you have ever eaten dal in an Indian restaurant there is a chance that you have already tasted it. In Northern parts of India, traditional dal dishes are made from the split or whole seeds. Black gram is an excellent source of nutrition. It contains a very level of protein with a 100 gram serving providing 25 grams of good quality protein while it is also an excellent source of dietary fiber. Black gram also contains a number of essential minerals including potassium, calcium, iron, magnesium and zinc. Black gram is also a great source of many of the B family of vitamins. It contains thiamine, riboflavin, niacin and folate which all play a variety of roles in human health and development. Because of this wide array of important nutrients and its high protein content, black gram has played an important role in the diets of people in India, Pakistan and Nepal for many years. A serving of black gram contains around 341 calories and provides over 25 grams of protein which is 45% of the recommended daily value. They are lower in calories than chickpeas but are higher in protein. Black gram beans contain soluble mucilaginous polysaccharides making them unique among legumes . They contain high amounts of dietary fiber which helps improve digestive health significantly. The dietary fiber contained in black gram beans also helps boost the heart’s health. By helping reduce cholesterol levels, eating black gram can also reduce the risk of coronary heart disease. Black gram beans contain isoflavones including genistein, glycitein, formononetin and daidzein. Research has found that these isoflavones may reduce the risk of osteoporosis and certain cancers in post-menopausal women. Urad dal are a great source of the B-complex vitamins. They contain a good amount of folate and vitamin B-12 which are essential to cell division and DNA synthesis. Getting plenty of folate is also very important for expectant mothers during pregnancy since it can help protect against neural tube defects in the fetus. These beans also have a good amount of thiamin, riboflavin, niacin and vitamin B6, all of which play an important role in various bodily functions. Black gram beans are a great source of important minerals. They are very rich in iron which is necessary to prevent anemia and plays a part in cognitive health. They are also a good source of calcium, magnesium, iron, zinc and phosphorus. They are also a great source of potassium which plays an important role in maintaining healthy blood pressure and overall heart health. Black gram has been a staple in India and other parts of the subcontinent for many years and for good reason. Not only do these beans taste great bit they come with a range of nutrients that can positively impact your health in a number of impressive ways. These are just some of the amazing health effects of eating black gram. I am sure that every one of you reading this article has suffered from some sort of digestive complaint at one point or another. Conditions like indigestion, bloating and constipation are incredibly common but they are easy enough to overcome by eating the right stuff. Fiber is especially important when it comes to digestive health. We all know how good it is for us after all we gave been told to eat it often enough. Unfortunately, many of us do not follow that advice and the majority of the population does not get as much fiber in their diets as they actually need. Fiber helps improve the digestive system in a number of important ways. It adds bulk to a person’s stools which helps the passage of waste through the intestinal tract. If you suffer from regular bouts of constipation, then chances are that increasing your fiber intake will make a positive difference. Fiber also helps protect against and ease a number of other common digestive issues like bloating, indigestion and cramps. There is also evidence that people who eat more fiber are less at risk of serious illnesses including colon cancer, heart disease and diabetes. Eating black gram and other fiber rich foods is also a great way to ensure your heart stays fit and string and free of disease. As well as reducing cholesterol, black gram contains several nutrients that can benefit the heart. Potassium is known to help reduce blood pressure because it acts as a vasodilator which helps ease the passage of blood through the blood vessels putting less strain on the heart. Black gram also contains folate which has been linked to a reduced incidence of heart disease. It also contains a good supply of iron and magnesium which help improve the circulation of blood around the body with positive cardiovascular benefits. 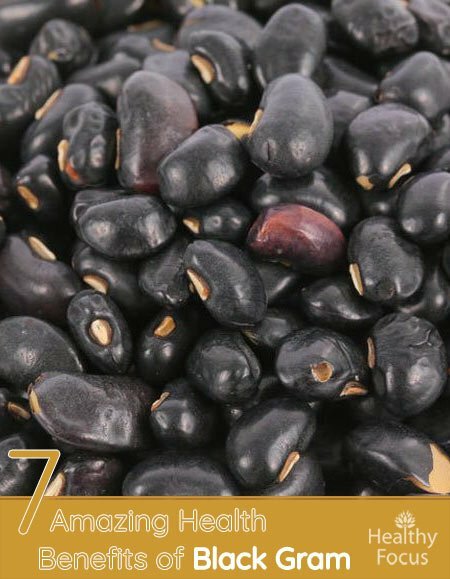 Black gram is one of those high fiber beans and lentils that are great for keeping blood sugar levels in check, this can reduce the risk of a person becoming diabetic and help diabetic patients keep their symptoms in check. One of the roles of fiber in the human body is to regulate the way in which nutrients are absorbed which helps to balance the amount of glucose and other sugars in your blood. A high fiber meal such as one prepared with black gram can help prevent the harmful spikes in blood glucose commonly experienced by people with diabetes. Black gram has long been used in Ayurvedic medicine – the traditional medicine of India – for its ability to ease inflammation and relieve pain. The wide array of nutrients found in black gram may help to ease internal inflammation while it may also help reduce oxidative stress in our bodies. Not only does black gram help with internal inflammatory conditions but an extract made with black gram is sometimes applied topically to deal with painful joints and muscles. Many of the minerals found in black gram, especially calcium, are great for your bones. Calcium is an extremely important mineral as we are growing and developing which is why young children the world over are given milk from during their childhood years. Not only is calcium important in developing bodies but it remains essential as we get older. In our later years, we lose our bone mineral density resulting in our bones becoming weaker and more prone to injury. Getting plenty of calcium as well as some of the other minerals found in black gram like potassium and magnesium can help keep our bones strong and reduce the risk of common conditions like osteoporosis. The high levels of protein and the significant amount of iron found in these beans make them a great way to increase your energy levels and reduce fatigue. Iron is a very important mineral when it comes to vitality. A deficiency in iron is known to have a number of nasty side effects including mental and physical fatigue and tiredness. It can also help ward off even more serious issues like anemia which comes with symptoms like muscle weakness, chronic fatigue and cognitive impairment. Powdered black gram is often used especially in India to help keep your skin looking fresh and feeling supple. It has excellent nourishing properties that can help rejuvenate tired and sallow looking skin. It is also used for a range of other skin problems including sun damage, age spots, wrinkles, acne. It is also used to exfoliate the skin and even combined with lemon juice to make a natural bleach that can lighten the skin. If you have never cooked with black gram before, I should tell you that it can be used in any number of different ways. Anybody that enjoys a delicious Indian curry can use black gram to prepare their favorite dish. You can use these pulses in much the same way that you would use other types of bean or pulse like lentils. There are any number of excellent recipes online covering traditional Punjabi black gram recipes to variations of black gram soups and even black gram snacks and deserts to enjoy. Absolutely. Black dal or black gram is a great source of dietary fiber and protein. It is also rich in various minerals and important vitamins including many of the B-complex vitamins. For vegetarians and vegans, black dal is a great source of protein that can provide you with much needed energy. The dietary fiber in black gram improves digestive health and can protect against heart disease. What is whole black gram? Black gram is a type of bean which is native to the Indian subcontinent but is now cultivated in a number of other tropical areas. The product which is usually sold as black lentil or black gram is the whole urad bean. The split bean with a white interior is usually sold as white lentil. Are there any side effects from eating black gram? Black gram is generally regarded as safe for human consumption in normal dietary doses. However, there are some precautions that you need to be aware of.